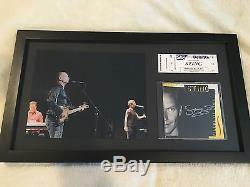 20" x 12" framed photo, autographed CD, and ticket stub from a private concert that I attended back in 2011. 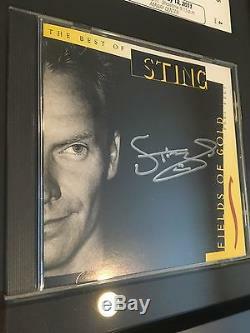 The item "Sting Very Rare Framed Autographed CD, Photo, Ticket Stub From Private Concert" is in sale since Saturday, February 20, 2016. This item is in the category "Entertainment Memorabilia\Music Memorabilia\Rock & Pop\Artists S\Other Rock & Pop Artists S". The seller is "hiddenphenomena" and is located in San Jose, California. This item can be shipped to United States, to Canada, to United Kingdom, DK, RO, SK, BG, CZ, FI, HU, LV, LT, MT, EE, to Australia, GR, PT, CY, SI, to Japan, to China, SE, KR, ID, to Taiwan, ZA, TH, to Belgium, to France, to Hong Kong, to Ireland, to Netherlands, PL, to Spain, to Italy, to Germany, to Austria, RU, IL, to Mexico, to New Zealand, PH, SG, to Switzerland, NO, SA, AE, QA, KW, BH, HR, MY, TR, BR, CL, CO, CR, PA, TT, GT, HN, JM.